More from "the Router Workshop"! Series 600 includes the beautiful Jewelry and Lingerie Cabinet, built in four separate parts. 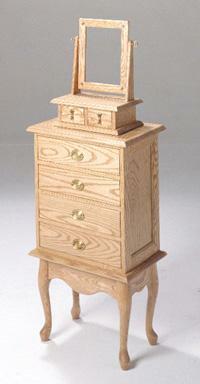 Each piece can be used alone or attached together to create this special cabinet. Furnish a hall or entry with a Table and Mirror sized for the space. Lots of CDs? 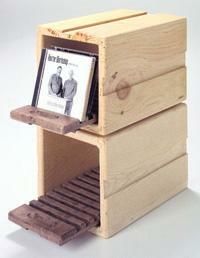 This stacking storage adds a module any time and the dovetail slots hold the CD at an angle to make it easy to read the title. 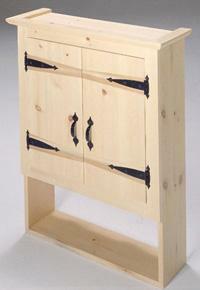 A Bath Storage Cabinet with a dovetail wedge door provides a different look. See how Bob makes perfect Oval Frames with a router. 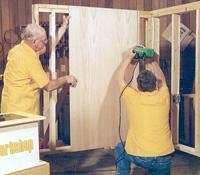 Discover the easy way to panel rooms in your home. Learn to scribe and make outlet holes perfect every time. There are few things so satisfying to build or give than a beautiful "Jewelry and Lingerie Cabinet". These four parts are each a separate project. When the four projects are combined, they are transformed into this unique cabinet. 601. Jewelry and Lingerie Chest, Part 1 Rick shows you how to pattern cut the rails and Bob creates a special jig to dovetail the rails into the "Queen Anne" legs in spite of their shape. 602. Lingerie Chest, Part 2 In this episode, we move on to the "lingerie case" itself. Bob will show you how to create sturdy, dovetailed drawers while Rick reveals the secret to creating perfect combination joints for the case frame. 603. Jewelry Case, Part 3 In the third episode in the project, "Jewelry and Lingerie Chest", we craft the jewelry case itself! Bob will show you how to make a jig for mortising the top and bottom while Rick cuts perfect combination joints for the box and adds a decorative mold. 604. Jewelry Case Mirror, Part 4 With the completion of the unique "Queen Anne" base, the lingerie case, and the jewelry case, our "Jewelry and Lingerie Cabinet" is almost complete. In the fourth and final part of this project, we crown the piece with the ornate mirror. Bob will show you how to cut dovetails across a 45� mitre while Rick cuts perfect EZ link joints for the delicate little jewel drawers. This episode of the Router Workshop shows the production of an "angle bookcase", that's perfect for the office, college dorm, family room or almost anywhere. Using special shop-made jigs, Bob and Rick mortise the shelves into the case sides at just the right angle and round over the side edges for a classic country look. A vintage "plant stand" provided the inspiration for this in the Router Workshop. Bob and Rick Rosendahl show you how to use your router station to create an interesting piece of furniture you can proudly display in your home. The delicately tapered legs are set at an angle to provide strength and the feet are cross-lapped to provide stability. 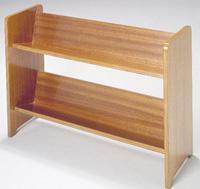 As beautiful as it is functional, the Rosendahl "plant stand" is sure to become one of your favorite projects! The Router Workshop project this time is a unique "CD storage case". Using a special shop-made jig, router experts, Bob and Rick Rosendahl show you a quick and easy way to mortise slots into the slide-out tray at just the right angle to hold, protect, and display all your CD's. You'll also discover a unique method of dovetailing the modules so that they can be locked together or used separately. 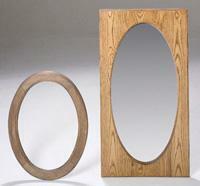 Building a "oval mirror" need not be the source of nightmares - if you follow the advice of router experts Bob and Rick Rosendahl. In this episode of the Router Workshop, we'll show you how to layout and cut two different kinds of ovals - quickly and easily. Plus, you'll learn the secret of the mystery "donut". If you're planning a paneling or counter top installation, you'll want to be with us for this episode of the Router Workshop. Watch router experts Bob and Rick Rosendahl show you some tricks of the trade in construction and renovation projects. Whether you're cutting around a wall plug, splicing a panel, or scribing an uneven wall, your router can be your best friend.